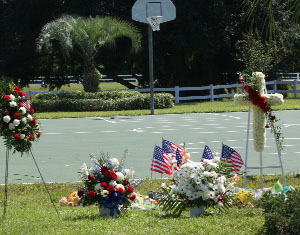 A memorial at a Twin Lake community park marks the spot where 41-year-old Iraq war veteran David James, of Valrico, was fatally shot following a dispute with a neighbor over a teen skateboarding at the local basketball court. As the investigation continues in connection with the shooting death of 41-year-old Iraq war veteran David James, of Valrico, who was gunned down in front of his 8-year-old daughter, questions of how something like this could happen or, more importantly, how could such a tragedy could been avoided lingers in the minds of area residents. Following a dispute over a teen skateboarding at the local basketball court, 69-year-old Twin Lake resident Trevor Dooley was arrested and charged with manslaughter for the killing of James, who was playing basketball with his daughter, Danielle. Dooley was also charged with improper exhibition of a firearm and openly carrying a firearm and is being held at the Orient Road Jail with no bail, according to jail records at the time of this article. While searching for answers of what would, could or should have happened, many wonder about the soundness of gun ownership, as well as the question of how to react when confronted or when witnessing a crime. Answering such questions did not take long for Hillsborough County Sherriff Office District IV Community Resource Officer Curtis Warren. “Owning a gun is a personal preference,” Warren said, adding that to carry a gun in Florida is allowed as long as it is in a zippered or snapped holster and, in the car, a gun must be kept under the seat or in the glove box. Warren emphasized that with such a law in place, residents should be wary to approach anyone or take matters in their own hands, either physically or verbally, warning to those with criminal intentions, such as car or home burglary. To shed some light on the opposite side of the spectrum, a recent Polk County incident stirred residents as they heard about the shooting death of a 15-year-old teenager by the homeowner as he caught the youth in the middle of breaking in to his home.While Warren agreed that the dispute over personal gun ownership will likely not end anytime soon, he emphasized that calling and reporting a problem, dispute, crime or incident policy requires no debate. To report a non-emergency to the Sheriff’s office, contact 247-8200.